We did it! 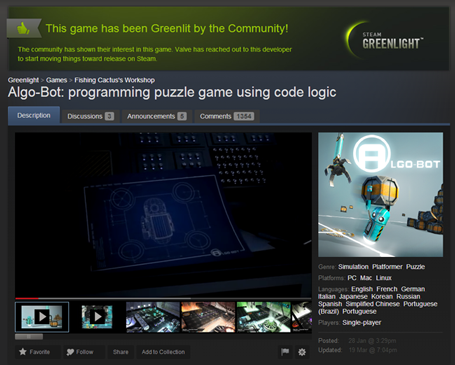 Algo-Bot has been Greenlit by the community and we would like to thank you for that! You can imagine what it means to us to have such a great community supporting the game. We are now more confident about the reboot on Kickstarter. If you want to get new about the reboot you can sign up to Algo-Bot’s newsletter here. This entry was posted on Friday, March 21st, 2014 at 12:51 pm	and is filed under Algo-Bot, Announcement, Kickstarter, Programming, Serious Games. You can follow any responses to this entry through the RSS 2.0 feed. You can leave a response, or trackback from your own site.